Roger Karlsson: This is the beginning. Heavily cropped and unsharp. When I read the comments to this one on Flickr I realized that the story pretty much was there from the start. I was quite old even then. Roger Karlsson, known as Coyhand on Flickr, is an intelligent and sensitive photographer from Sweden, he lives in a small rural village amidst nothing but forests. 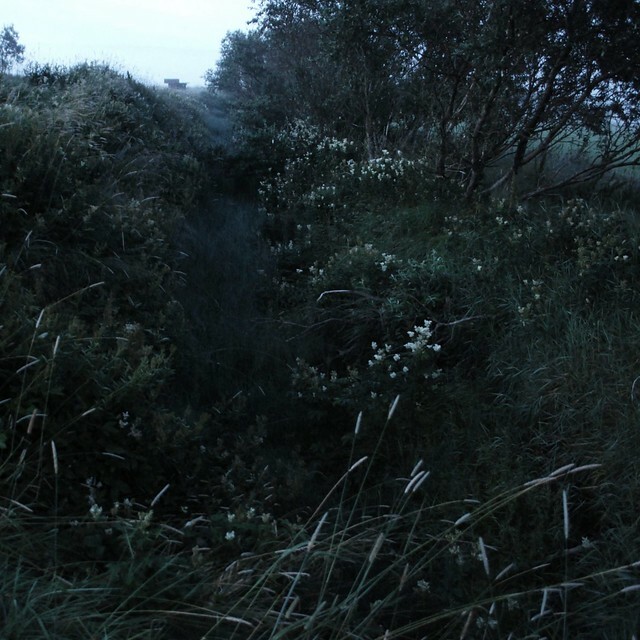 His images of these forests are dark and powerful, they seem to carry hidden meaning. Roger was kind enough to answer my questions about his work, including some valuable lessons (for me). Me: How do you maintain such a steady quality in all your photographs? Roger: When I go through my archives I always find images that I can’t believe I dismissed the first time. It has then been a year, sometimes two, from when I saw it the first time. When I edit, I quickly lose my ability to judge and must take a break, the longer the better. That’s partly why I don’t do a lot of post processing, but give each image a minute, adjusting brightness and contrast. The subject of the images is the same which makes it easier to maintain a certain quality, as comparisons with previous images is possible. You should only compare with yourself, making it possible to stick to what you do and concentrate on your personal creative development. Quality in art is a social construction. The demands you put on yourself should be your own. Quantity is underrated, I think. Quantity has consequences. The traditional landscape photographer may wait days behind the camera for an image that he is sure is good and then work with it in the computer for another day. In the meantime, I take an eight hour walk in the woods and shoot five hundred images. Ten of those are good with my standards. One of them might even be appreciated by the traditional landscape photographer. Me: How do you go about taking these photographs? Roger: It’s important to me that my photographing gives me more than the pleasure to create images. It also gives me a physical challenge and adventure, continuously exploring new land. It very much began as a revolt against decades of too much time spent in front of computers and books (being intellectual). I felt as if I had been deprived of not only my physicality, but also years of my life, having nothing to remember. After finding photography I am fine again, it takes me out, it makes me sensuous, alive. Nowadays my walks are very planned, even systematic. The large amount of work that I performed the first three years gave me experience, that now feels like a gift: when I am out there I can be very effective, knowing what I want, knowing where to search for it, knowing how to capture it. Quite often I need to try a couple of different angles and distances to be sure to capture it. If the camera is ready like I want it then it’s over in a couple of minutes, sometimes it takes fifteen, if it takes more it’s probably pointless. Me: Do you underexpose the images? Roger: Bad weather is essential for capturing the moods I’m after. I often underexpose on purpose. In bad weather it’s closer to the truth, as my eyes see it. Me: Do you ever feel blocked? Roger: Hard to answer. Typically, the answer would be: I have my concept, I want to continue with it, let’s go. When writing I often feel blocked though, and it has to do with a sense of never quite being able to express in words what I feel or with convincing logic summarize what I know or think. We talked about oneness (Roger mentiones it on his profile), we are all part of the whole, inextricably linked together. Roger: I think images are a bad way to experience the oneness. To feel the oneness is to feel present, to describe not your life, but to describe with your life. Do not say that you are, but be what the world are. Those who do not understand talk about understanding. Those who crave the feeling talk about being present. To be out there in the forest and not behind a desk in front of an image of trees, that’s crucial. Being out there has made me more aware, more sad, more angry. The story, therefore, behind my images is indeed evolving. Not only because what I’ve seen and that I’ve seen it with my own eyes, but because it has become a part of my life. 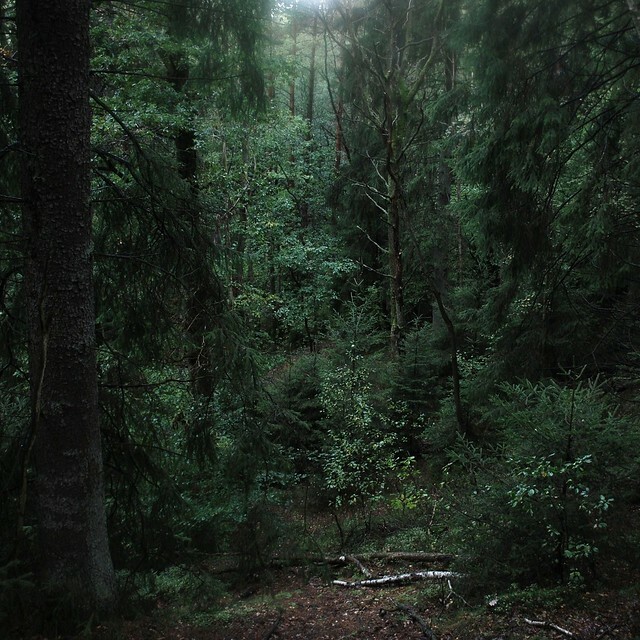 And I’m alone in these forests, it’s just me and the people who fell the trees and hunt the animals. This is not a part of people’s lives. It cries out to be documented. But my work is highly subjective. I do not bear witness. I wish I could. Sometimes I try. Think about an image: a valley, steep sides covered with trees that join the sky, a visual promise of a wild and untouched realm. Nothing reveals that the photographer has his back against a highway. The deafening noise is not visible. The stench of exhaust fumes is not visible. The lack of wildlife is not visible. Highways and wildlife fencing are not visible if you choose not to display them. The camera gives us images of illusions that need us. Our body gives us the image of reality that we need. An image is not worth a thousand words. An entire novel says no more than a single image. They are parallel. Two worlds. Me: Great image. Last question, which artists inspire you? Roger: Visual arts of all kinds have always meant a lot to me. I think it began with comic books. My admiration for some comic strip artists was tremendous. I’ve never had to learn how to compose, maybe because I grew up on Barry Windsor-Smith (Conan the barbarian) and the like. Overall, I am inspired more by great painters. I want to mention Roj Friberg. Lars Lerin has made a series of watercolors of depressing clear cuts. Hans Jörgen Johansen, photographer, has made landscapes of mold that are eternally fascinating. Roger: I saw the wagon up there, and, as I use to do, let it stay way back, shoving nature into the field of vision. For me it’s a way of showing what’s important. Let an abandoned house drown in the bushes. Let a whole city skyline get caught in the arms of an uprooted tree. It puts things in their place. There’s nothing new doing this, to make people feel insignificant in comparison to the universe. It’s there since the beginning of arts. You ask if this image is spontaneous. Yes, it is, very much. Roger: I am throwing in a clearcut now and then, it would be dishonest not to. In these woods you are never more than minutes away from eyesores like this. 98 percent of the Swedish forests are in various stages of deforestation. If I want to see a big tree, I go to a city park. It’s that bad. What I feel most when I see this is solitude. I am alone here. 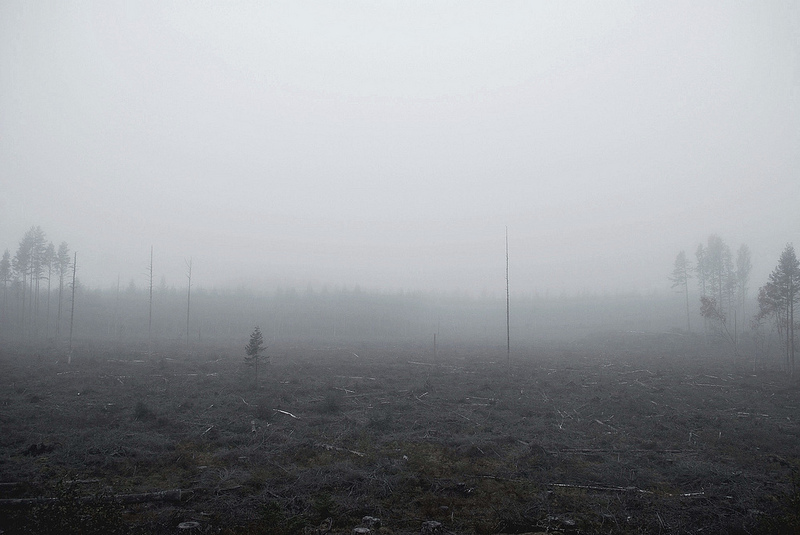 The woods are empty, as hit by a plague. I think it’s a big mistake to diminish them, to empty them. We are moving away from places that we have not even visited. Yes, this is making me feel different. From the rest. As if also I move away but in a direction entirely my own. I am happy with this one. I think it pretty much nails it. Clearcuts is a challenge. Thank you Roger Karlsson for you insightful answers. Good luck with your body of work. I hope this finds you well. Many compliments on your photography. I saw several images that I found fascinating and hope to see more. Im from Ireland but I’m writing you from Florence Italy where i currently live. I googled Roger Karlsson photographer and found your interview with him. He has been one of my favorite and most inspirational contacts on Flickr for several years but he seems to have stopped posting in 2017. His website doesnt seem to be active any more. I miss seeing his beautiful forrest images and was wondering if you have any up-to-date information or news about him and where i can continue to see his current work. Previous Previous post: Pocketwizards with leaf shutter: are they fast enough?